Piccadilly Prairie's Paris Flea Market Offers Shoppers an Authentic French Feel. The 2019 Best of Edina Survey is here and we are thrilled to be a nominee for Best Gift Shop! We are thrilled and would love to have your vote! As summer draws to a close, and everyone is thinking about “back to school,” we wanted to share some fun ideas for kids’ design in the form of little workspaces… Putting some time and love into your kids’ homework area might just make them want to do their homework! Maybe. Weathered rustic is always our go-to for core pieces, and this kids' desk is no exception! A fantastic vintage find, it's also a fairly easy style to mimic, with its sawtooth legs and long, door-like top... A functional, neutral piece like this allows you to pull the space any which direction. Vintage school desks are a lovely way to add some layered charm to a modern room! An easy update is painting the metal base with a bright white enamel. It's an easy DIY: just unscrew the base from the top, and then take it to a well-ventilated area and spray paint away! Make sure you use a water-based enamel with a built-in primer, like Rust-Oleum. It's worth the extra couple of dollars for good coverage and soap + water clean-up! Chalkboards are a fun and budget-friendly way of letting their artistic juices flow and working out those math problems long-hand (because you never know when you might be without your iPhone calculator)... Nudge, nudge, we build custom chalkboards! If you've got the room, a chalkboard wall is a great way to define the space! You can go all the way up, or use painters' tape to create a pattern along the top. For our chalkboard wall at the store, we used Rust-Oleum brand (not to be confused with chalk paint, which is for furniture). In this day and age of Google Earth, it can be refreshing to lay eyes on an old-fashioned map or globe. Beautifully colored and designed, though not necessarily accurate, they can add a touch of adventure, which is a definite plus in a kid's room! And, for your blossoming artist, may we suggest our very own art supply caddies...made from reclaimed oak and filled with crayons, markers, and colored pencils! Available at Piccadilly Prairie (while supplies last). When you think of wallpaper, what comes to mind? When I was 9 years old, we moved into a new house; new to us, that was… the house definitely gave evidence of its former owners with its wall-to-wall shag carpeting, and dark 1970s wallpaper. I remember experiencing a “wallpaper removal party” that consisted of numerous adults, buckets of water with dripping wet paint rollers, and lots of putty knives. It was a tough, messy job, but someone had to do it! After all the hours of soaking and scraping, up in its place, went the prettiest pale pink and green wallpaper I’d ever seen, wrapping around the open dining room/living room floor plan. In retrospect, it was like the inside of a bowl of frosting, with its streaks of pastels and thick texture. 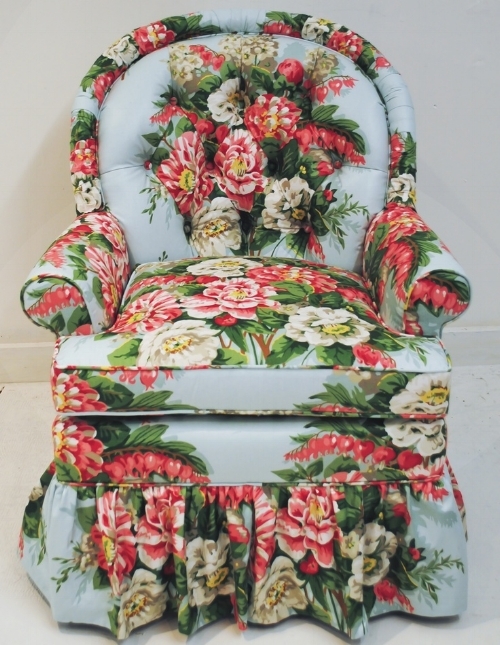 But, hey, it was 1987 and between the wallpaper and the chintz sofa, our new house soon felt like a page out of a magazine! Huge, pictorial tapestries were the inspiration behind the invention of wallpaper in the 1700s. Colorful and intricate, they warmed up the stone walls of the elite class. But, they were expensive. The first wallpaper gave the less-wealthy elite a more affordable option. The wallpaper was sometimes hung in loose strips on the wall (just like tapestries), and was sometimes pasted to the wall (similar to today). With the development of steam-power printing in the 1800s, the availability and affordability of wallpaper spread to the working class as an easy way to brighten up their small, dark living quarters. Wallpaper rollers were used to transfer the images onto the paper. 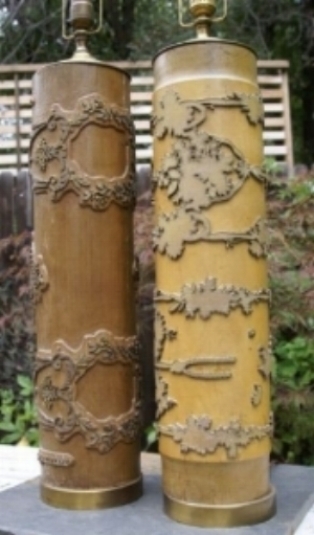 Each wooden roller would have its own design with a corresponding ink color, eg green leaves pattern, and was then rolled onto the paper via a four-color print machine. We sometimes come across these antique rollers and list them in our Etsy shop. They are beautifully sculptural on their own, with faded traces of the old ink, and some people make them into lamp bases. Etsy is a great source for modern wallpapers from around the world, especially removable ones! These are a great option for rentals, since there’s no wallpaper glue. The paper peels off just like a sticker, leaving no residue or damage. Total heart eyes for this design by Etsy shop: patternsCOLORAY. We often get asked about our wallpaper (on the front left side of the store). A great balance of modern and rustic, it’s neutral enough for almost any space - large or small! In the above image (www.homepolish.com), we see a primarily black + white color theme, with an emphasis on typography. The word prints take center stage, with their clean look and inspirational messages. The accompanying photos are slightly smaller, wrapping around the focal points and following the same neutral color palette. The overall look is clean, modern, and minimal. It would work just as well in an office as it would in a living room. Above, we find a great example of a gallery wall (www.domino.com) with pops of color, as well as black + white images. You’ll notice that all of the images are photographs, and they work together to tell a story of travel and wanderlust. The two wooden statues sitting on the floor become part of the display your eye takes in, thanks to the single photo also sitting on the floor. Connecting what’s directly under the gallery wall, whether it’s a floor or a table, can add a 3D quality to your display. The above display (Piccadilly Prairie) is rustic and outdoorsy, with more than a nod to our great State. Even though the individual pieces vary in what they are -lithograph print, painting, found vintage, wood art- they speak to their common theme, and so make sense together. Notice, again, how the oar is sitting on the floor instead of hanging on the wall. Any small, rustic entry table placed beneath the wall art (to the left of the oar) will become part of the display, as it’s visually connected by the vertical oar. My favorite thing about this gallery wall (http://honestlywtf.com/home/quincys-room/) is that it really demonstrates how you don’t need a large space to create one! Displays that are wrapped around corners, whether coming into a corner or going around a corner, can be just as eye-catching as a large collection that hangs over the back of a couch. A gallery display tucked into a corner feels cozy, and beckons you to come close and have a look; while one that wraps around a corner creates a “stop and smell the roses” moment, in which you can’t help but pause and take it all in. Summertime is here, with long days spent at the lake and playing good, old yard games like badminton. By re-envisioning some of these classic hot weather pastimes, it’s easy to incorporate a playful, summer-y feel into your home or cabin! Vintage collectibles, from croquet mallets to game boards, are often replete with bright colors and graphics. With a little imagination and a trip to the hardware store, you can create displays that will bring the sunshine in! These croquet mallets are simply balanced atop long nails on either side. If you have little kids or large dogs that might easily upset your display, you can add sawtooth hangers to either end of the mallet, and then use metal picture hangers with nails in the wall to keep them secure. The bright colors, clean lines, and symmetry of the mallets make for a fun display that fits easily into any room! 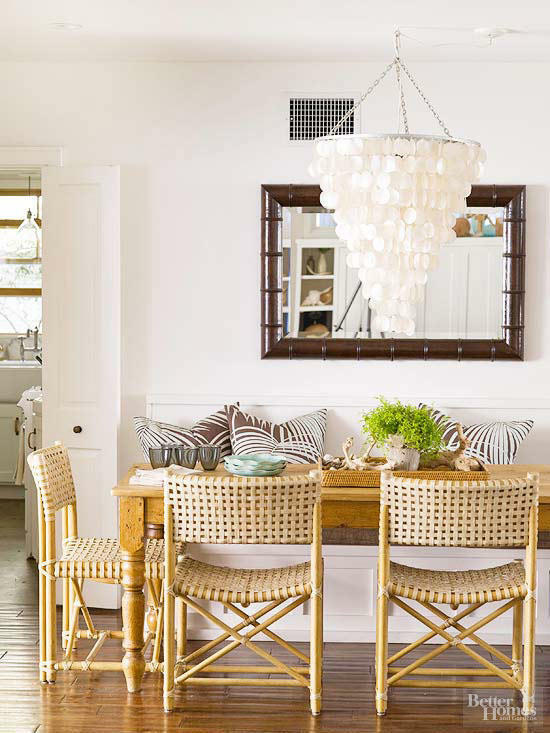 Bowls & baskets of orbs have long been a decorating go-to...spice up a tired display by using vintage pool balls instead! These are just a few ideas to get your mind churning...but the possibilities are endless! Visit our brick & mortar store at Southdale or our online Etsy store for more suggestions and to create your own inspired, summer displays. If pretty design images take you to happy places, then pack your bags. This week, we are all about the inspiration. Platforms like Pinterest and Instagram are teaming with eye-candy, and it’s easy to whittle away the hours in search of the prettiest photos and “what’s trending now.” This week, we thought we’d share some of our favorites; a few you might recognize, but here’s hoping we’ll introduce you to some new ones along the way! Design Sponge - @designsponge - if you haven't heard of it, you may very well be living under that proverbial rock. Described by the New York Times as “Martha Stewart Living for the Millennials," Design Sponge was named Top Home Influencer of 2017 by Forbes. DS is a daily blog, with inspirational stories coupled to their eye-catching photos. Our favorite sections include "Interiors" and "Life & Business." They also have a strong following on Pinterest. Meet Spring Cleaning's Best Friend! Freshen up and get organized! hook racks in a kid's room or husband's closet are a great way to keep clothes off the floor! You don’t have to do everything at once! If you’re anything like me, the thought of trying to declutter your entire place in one fell swoop can seem like an overwhelming task...so overwhelming, in fact, that you decide it’s best not to start. So, pick one area to do first...and, even better, pick your favorite area! Whether it’s the sunroom where you enjoy your morning coffee, the bathroom where you get ready in the morning, or the bedroom where you hang out and read. Diving into your favorite room first will motivate you, since you’re emotionally invested in the space, and the end results will spur you on to tackle the next spot! vintage olive buckets house doggie toys in style! Remove anything that doesn’t bring you joy. Sounds weird? This KonMari method (www.konmari.com) is one of our favorite ways of deciding what to keep and what not to keep. So often we get caught up in the idea of something being practical...but does it make you happy? Does it bring you joy? Maybe it used to and it doesn’t anymore; maybe it never did, but you felt a responsibility to hold onto it? The question of joy is an easy one because the answer comes from the heart. So, start by going through the space, picking up each item and asking yourself: Does it spark joy? You won’t have to think about the answer; you’ll feel it. single hooks hang by the door to catch keys and the dog's leash...or mount three of them on a barn board for a dramatic look and added storage! Dig out some bags + boxes and mark them for donation, resale, or give away to friends. Then, fill them with the items that didn’t pass the “joy” test. There’s a Goodwill in just about every city; some charities (like Salvation Army and the Epilepsy Foundation of Minnesota) will even pick up your donations. There’s also resale. Just know that when it comes to getting money for your second-hand goods, they need to be in excellent condition and generally not more than a couple of years old… You can Google “consignment” or “resale” with your zip code, if you wish to bring them to a store. Or you might opt to sell your stuff online. Craigslist, OfferUp, and Facebook are popular sites where you can sell for free! Be sure to include good, clear photos of your items and dimensions. After you’ve decluttered your favorite space, tackle the area that bugs you the most! Is it the junk drawer, the hall closet, the spice cabinet? Wherever you find yourself grumbling every time you have to interact with the area is the one that needs your attention. First, look at the space and decide what you want it to be. Maybe it’s a linen closet, but the cleaning supplies always seem to end up there. Would it be more practical for it to serve as both, linen and cleaning closet? Pull everything out and start sorting. You might think that it isn’t possible to do a “joy” test with linens and cleaning products, but I can honestly say that stain-free, white Turkish bath towels and Mrs. Meyers Lemon Verbena Multi-surface spray actually give me joy. So, yes, it’s possible. Once you have your joy pile, separate that into categories: like with like. Cleaning products together, linens together, outdoor toys together, etc. Does it make sense for each of these categories to live in this space, or would some of them make more sense somewhere else? (hint: I like to keep the swimming pool toys -which we use regularly- in a basket in the front hall closet, where we can easily grab them as we’re walking out) Once you’ve determined what should go back into the space, identify the organizational and storage pieces you need to keep it tidy. Hooks, bins, shelves- look at the space and look at your stuff- then, make a shopping list. Our favorite go-to places for baskets, shelves, racks, and hooks are Piccadilly Prairie and IKEA. But, make sure to take your measurements and needed quantities with you, so you’ll come home with exactly what you need! Then, install your goodies, and introduce your stuff to its new home. vintage crates add graphic interest with a pop of color! Springtime means freshening up and breathing new energy into languid rooms. After the cleaning and organizing, adding a new element -such as a wood wall- or just swapping out some accessories can make all the difference! Between television and social media, style trends are spreading quicker than ever. Here are some of the 2017 design trends that are inspiring us- we hope they inspire you! The Modern Farmhouse style has exploded in popularity. Why? It's that this style provides a juxtaposition to the rest of our lives. With everyone's hectic schedule -work deadlines, kids' sports, and the constant stream of updates on our mobile devices- coming home to a space that's clean and natural, with just the right amount of "nostalgia," can bring a calming sense of balance to lives that are anything but. 1. Lots of white + natural light-- choose a clean, neutral white (we love Benjamin Moore's Simply White), and ditch the fussy drapes or shades that are blocking your windows for natural colored shades (either fabric or fiber) that fit inside your window frames...or, if privacy's not an issue, leave your windows completely exposed. 2. 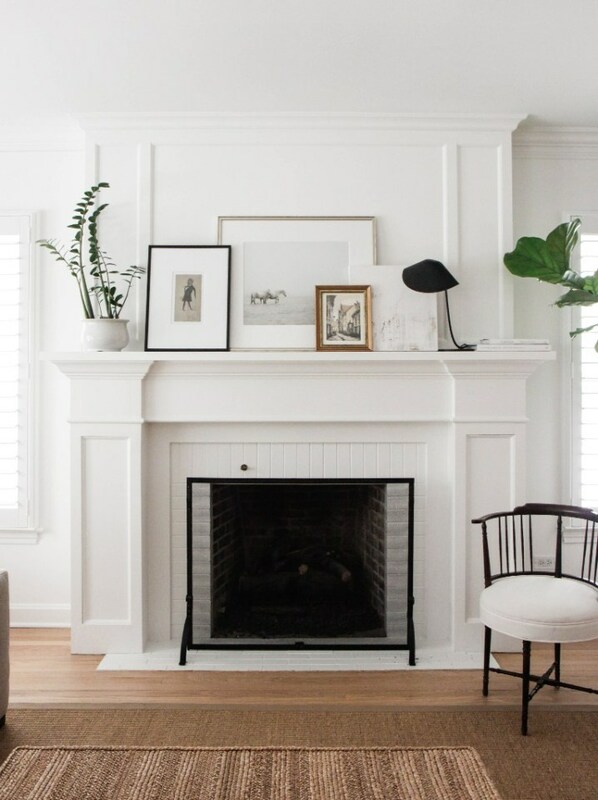 Shiplap-- this popular take on "wood walls" continues with the white theme...installed horizontally or vertically and painted white, it adds texture and depth without the clutter. There's even a removable "shiplap wallpaper" out there. 3. Speaking of clutter-- cut down on the accessorizing. Instead of myriads of small knick-knacks lining a shelf or mantel, choose 2 or 3 larger pieces. They'll add drama and interest without being too busy. And, when selecting those highlights, opt for natural materials, including one plant or bouquet of branches (in a striking container, of course). 4. And, lastly, that table... reclaimed wood is going nowhere anytime soon (thank goodness!). The character and age it gives to a room can't be faked, not even with the best repros. 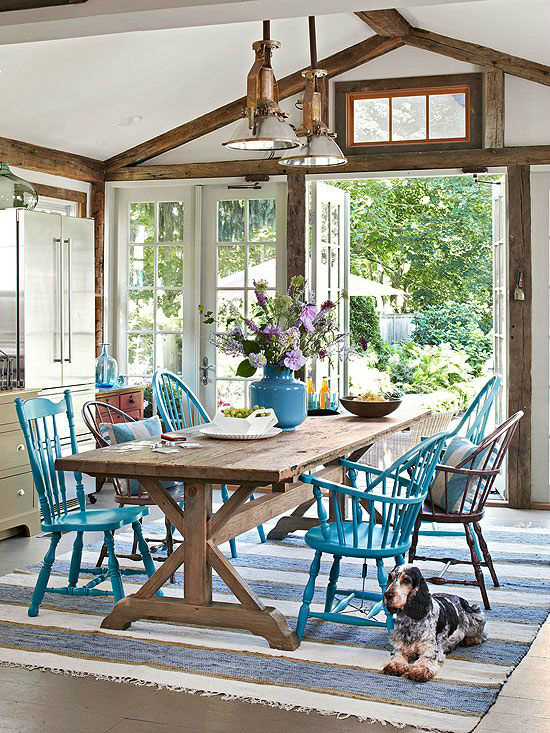 Opt for something clean, but as rustic as possible. You won't believe the difference it makes! This picture really illustrates how the seamlessly a Modern Farmhouse look can blend with other styles. 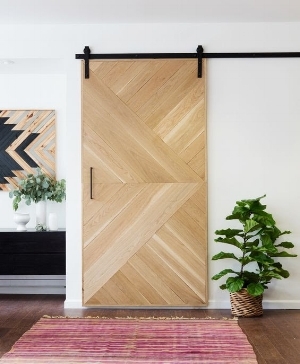 The sliding barn door (classic "farmhouse") is given a more modern look with the triangular wood pattern and sleek, black handle. The fiddle leaf fig in the wicker basket and a pink chindi rug add just a touch of bohemian. And we can't be sure, but we're wondering if that wooden wall hanging on the left might just be one of our very own Minnesota makers? Handmade, reclaimed wood art $525, available at Piccadilly Priarie.